Perhaps I should start with a particularly popular design. I’m sure this has been done time and again by many different people with a steadier hand and better skills. But I had this stuck in my head and decided to give it a go. I began with a clear base coat, as always. I’ve had bad experiences with accidental nail staining, so this is a definite must for me. I then applied two coats of red – if you have decent quality polish then one should probably suffice, but I like to strengthen the colour and even out any visible strokes. Once dry, I used nail polish remover on a cotton wool pad, folded in half to give a straight edge, to take off the tips of the red. I then coated the tips in a plain white. Whilst waiting for these to dry, I used a white nail art pen to place four small dots, evenly spaced apart along the main red section, to use as a guide. If your nails are longer then it’s easy to do more, it just depends on how you want them to look. I then joined up the dots with a lattice pattern, with a straight line connecting the two closest to my cuticles. Once the tip was dry, I used a black nail art pen to trace a semicircle outline along the top edge of my nail, leaving a slight border. After everything was completely dry, I completed with two coats of clear polish as a final top coat. The design will be slightly raised, most noticeably around the laces, but this shouldn’t be a problem, especially if you use a top coat. If you have time/patience, used a little nail polish remover to neaten up the edges around your nails and along your cuticles, particularly if you’re as messy as I am. Colour: I chose a glittery red for mine, but these of course can be done with any other colour you fancy! 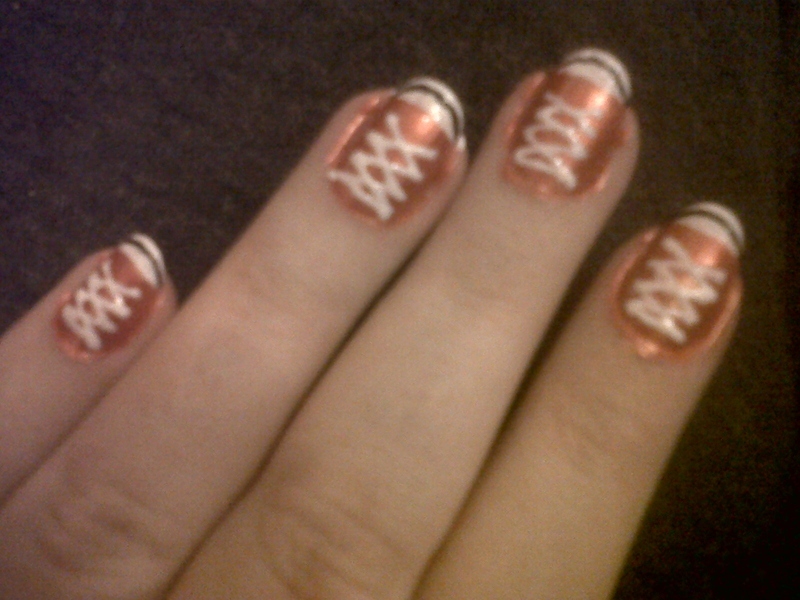 Converse shoes generally have white laces, but this too can be experimented with – artistic license ftw! The Tips: If you’d prefer not to waste time and nail polish remover, then it is possible and perfectly easy to use tape to cover the tips whilst painting with the main colour. This doesn’t have to be any special kind of tape, standard sellotape will do, but I’ve found it best to stick the pieces to fabric before applying to your nail – this stops it from taking off your base coat or your nail enamel. The Laces: If you have long or particularly spacious nails, you could try adding a bow to the laces, to give another fine detail to the recognisable shoe design. Nail Art Pens: If you don’t have any and don’t plan on investing any time soon, then try obtaining a small pot of toothpicks. 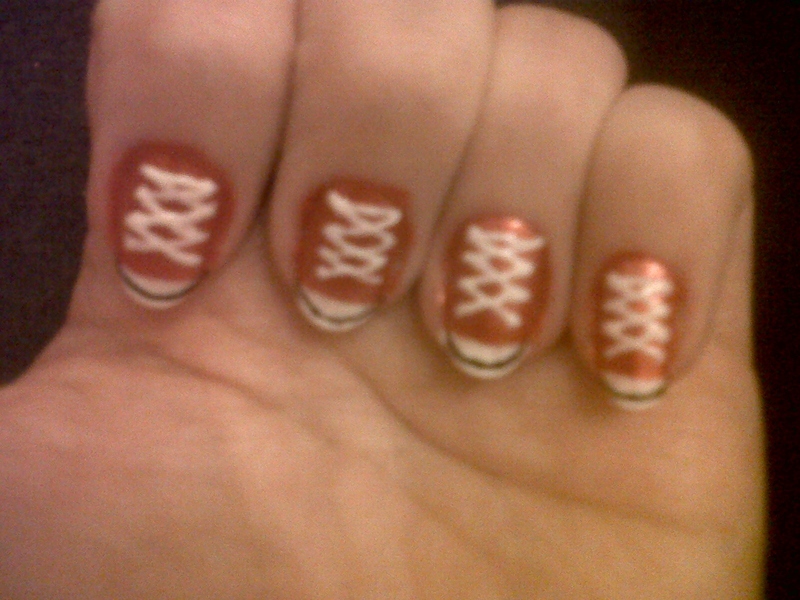 These can work just as well with practice, just dip into your nail polish and create your art just the same! Do take the time to practice before you embark on your final project though, as it took me some time to get the quantity of paint vs. the movement of my hand just right. Other styles: If you’re feeling particularly adventurous, then you could try other recognisable styles of shoes, or perhaps just your favourites. From fuzzy slippers, to skater sneakers, to stilettos – all it takes is a little imagination and a bit more time!